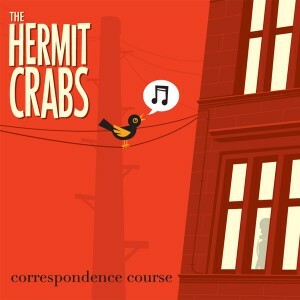 Splendid new EP from heralded Scottish band The Hermit Crabs! Following impressive debut single ‘Feel Good Factor’ and album ‘Saw You Dancing’ last year, the Glasgow band spent a year sharpening its live set with shows across the UK plus an appearance at the New York City popfest. The four new songs on this EP accentuate the rich instrumentation present on earlier recordings with a diverse mix of acoustic and electric guitars occasionally embellished with distortion and present a more upbeat, poppy side to their sound. Lead track ‘About You Before’ is a swinging number about summer relationships that boasts melodic vocals, nice orchestration, a soaring chorus and great bursts of percussion. ‘Correspondence Course’, driven by superb violin arrangements and distorted guitar bits, is another tale about the china girl mentioned on their debut single. ‘Turn The Clock Back’ is a beautifully pensive one about a breakup and the little things you miss when you’re not going out with someone, while ‘I Don’t Know How’ is a classic case of saving the best for last—an upbeat hit with a sixties vibe, surf guitars and a great singalong chorus. It’ll even have the indie hipsters dancing by the end so don’t fight it, feel it! Well written and perfectly produced, ‘Correspondence Course’ pops and crackles in all the right places and is a fantastic step forward for the band. Limited to 1000 copies in custom minijacket sleeve.